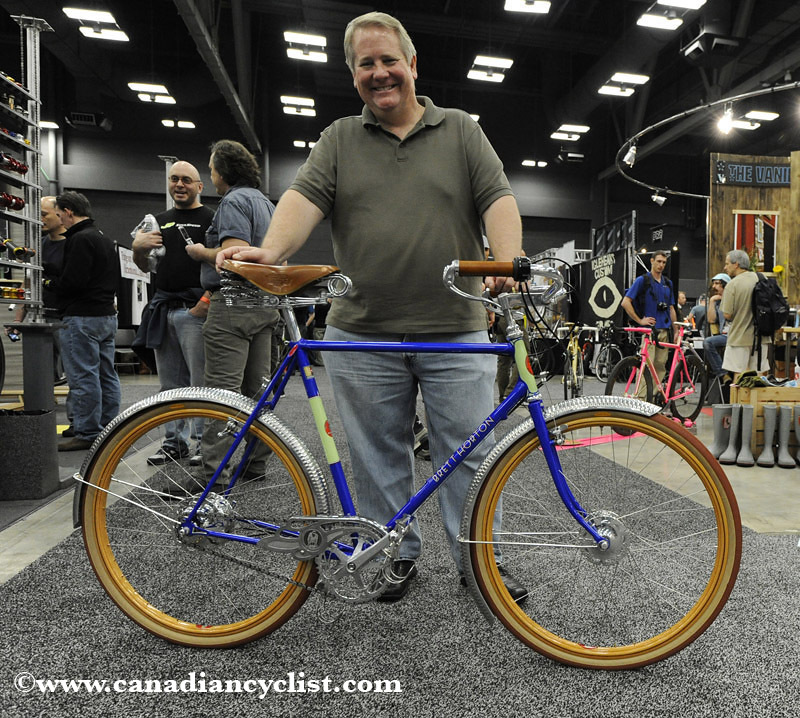 The North American Handmade Bicycle Show (NAHBS) has returned to its Texas roots for the seventh edition, in the cycling friendly city of Austin (the first one was in Houston). 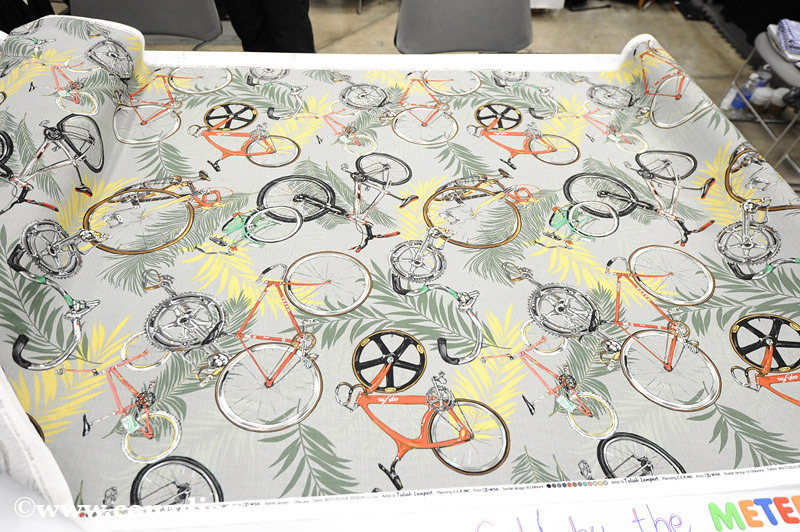 This unique event continues to grow every year (up to 164 exhibitors), as more and more people embrace the idea that a bicycle can be as individual as they are. 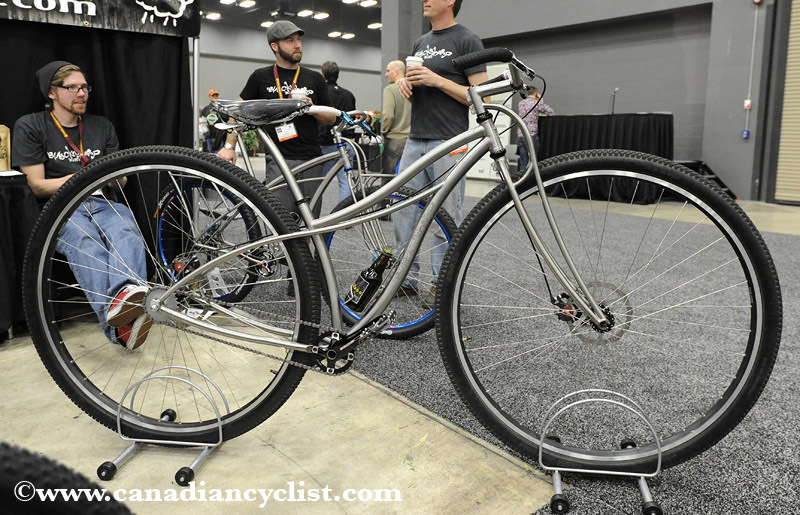 The show has grown well beyond just frame builders, with artisans of clothing, components, bags and much, much more displaying their wares to a very enthusiastic cycling community. 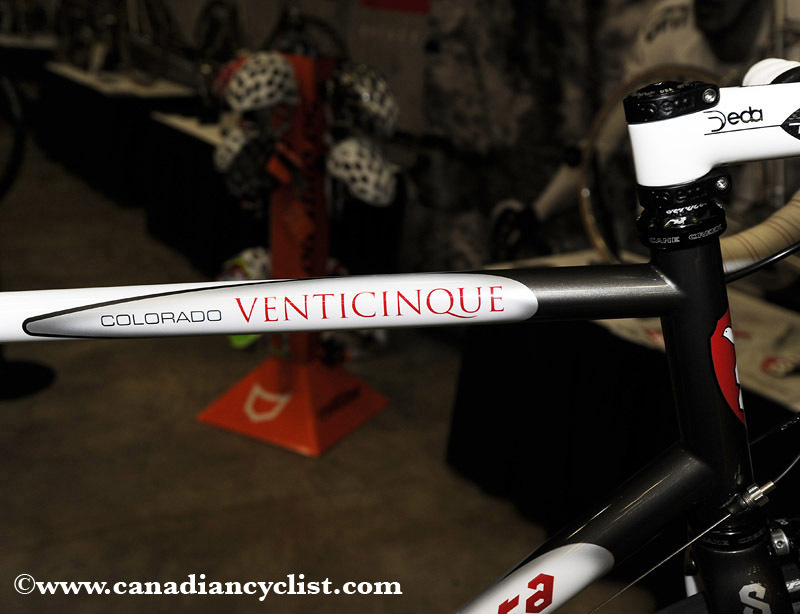 Less Carbon - While some builders are building full carbon bikes, many more are instead incorporating carbon into their designs, with one or two composite tubes married to steel or titanium. One of the more unique and handsome designs was by Independent Fabrications, who had a carbon seat tube piercing a top tube / seat stay cluster. Less Ornate Lug Work - There were certainly some fine examples of the craftsperson's art but, compared to last year, a lot more builders were focussing on lugless designs and clean lines. Exotic Materials - Once again, there were a sizable number of builders displaying bikes made of frame materials such as wood and bamboo. Urban Bikes and Accessories - Road bikes exceeded mountain, but both were outnumbered by the number of commuter, touring, cruiser and just plain lifestyle bikes - and things to put on them (or yourself). These makes sense, since any aspiring racer probably can't afford one of these custom jewels (and who would want to risk crashing it, anyway? 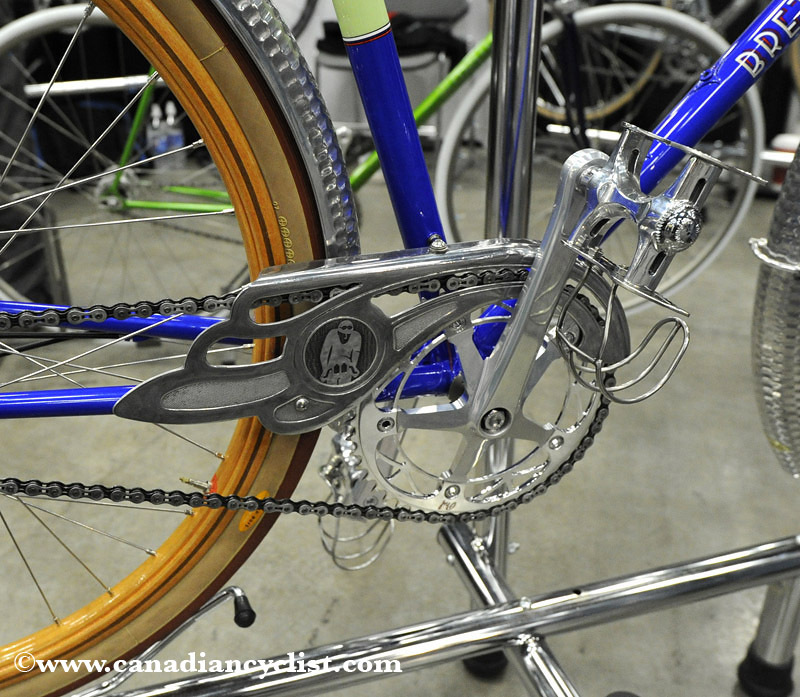 ), and this type of bike is as much about the aesthetic as anything else. The ultimate example would be the Brett and Shelly Horton one-off bikes - we will have a full feature on these bikes, each of which is, literally, one of a kind. Lifestyle Accessories - Pretty much every single exhibitor is able to sell you a t-shirt, and the range of accessories available to show your devotion is staggering. Beer, shot or whiskey glasses, cowbells, toques, aprons, belts, postcards, jackets, pins, bottle openers, calendars ... the list goes on and on. Attendees were also wearing their best old race t-shirts, retro jerseys and messenger bags - think of it as the cycling version of a Trekkie convention (not that that's a bad thing). If we sound a tad cynical, we aren't - it is great to see this level of enthusiasm and excitement, which is sadly missing from many of the major shows, that have become strictly about the business side of our passion. And now on to the first of our specific picks from the show floor. Brett Horton is a passionate collector of cycling memorabilia; the owner of one of the largest collections of cycling artwork, rider jerseys, bikes, catalogues, etc., in the world (see The Horton Collection). Let's start with the tubing - each bike has its own model of Columbus tubing, and by 'its own', I mean that Columbus produced just one tubeset of the specific design. Each design is named, like any other Columbus tubeset, and appears in the Columbus registry of tubing, but there is only one example of each in existence. Lest you think this is just one man's folly, it isn't; Brett Horton has a deep love for the traditions of the sport, and almost all of his modifications or designs are based on classic products from the history of the sport. When we chatted, he was bursting with excitement as he detailed what is on each bike, and how he came up with the idea. Want to do this on your own? Better plan on winning the lottery. Brett Horton collaborated with many members of the bike industry, who all bought into the concept. However, he says that there is an estimated 1500-plus hours of craft that has gone into the project by individuals involved and if someone were to pay the full cost of producing these unique bikes it would be - hold your breath - at least $150,000. At least a dozen trade shows around the world have asked to display them, but Brett assures me that they will be ridden by he and Shelly once the project is complete. Ben Serotta is celebrating 25 years of collaboration with tubing manufacturer Columbus by introducing a new, lighter weight and more responsive limited edition version of his Colorado, the Venticinque. It will be limited to 25 custom-built bikes (and half are already sold). Taking the big wheel craze one step further, Black Sheep introduces the 36er... It is not just a one-off example of what they are capable of, according to a spokesperson - a number have been sold (at $7000 a pop). We are told it rides over stairs, rocks and logs like they aren't there, but that the steering is 'a little slow'. 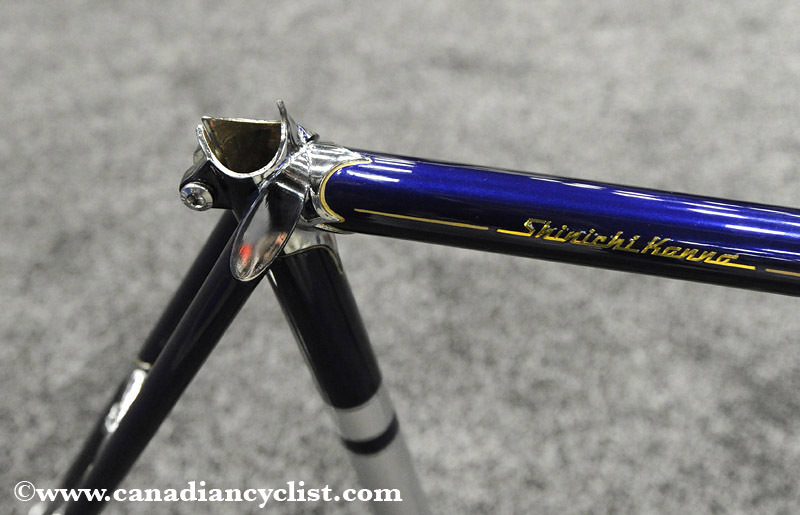 This Japanese framebuilder is making his first appearance in North America. The extremely curvy TT bike was front and center, but in the background we could see what looked like an extremely fine example of a traditional lugged road frame, so we asked to see it. It is a very, very nice, clean bike, and we said that it reminded us of the legendary 3 Rensho bikes of the 1970s and '80s. Well, it turns out that the builder at Rensho and the father of the current Cherubim builder were the Konno brothers (a third brother was also a framebuilder), and started together, before Rensho spit off as a separate company. Talk about a small world... Cherubim is the only surviving company, with 3Rensho and Miyuki having ceased operations. Easton is starting a new contest, open to Canada as well as the U.S. The winner gets a custom built, $9000 Land Shark road bike, kitted out with lots of nice Easton stuff. The catch? You have to create a miniature version of your dream bike out of a single spoke and submit it to a Facebook page, where it will be voted on. The contest runs until April 18th. Visit Easton at www.eastoncycling.com for more info.